A Daily News exclusive today shows new renderings of the flagship Atlantic Yards tower but hints at many questions unanswered, notably the apparent dumping of a Phase 1 tower at Site 5 (see building at far left below), the continuing role of architect Frank Gehry, the plans for the proposed Urban Room, and new designs--apparently with less glass, a potential security issue--for the planned arena. 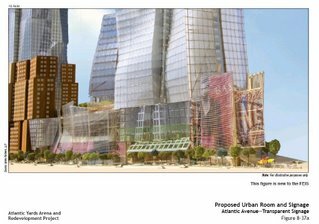 The 373-word article, headlined (online) Atlantic Yards' Miss Brooklyn is slashed more than 100 feet in massive redo, suggests that the news is that the tower would be cut to 511 feet and feature commercial office space only, but neither is a surprise. After all, the agreement to keep the tower shorter than the 512-foot Williamsburgh Savings Bank tower was announced as a "concession" on 12/20/06, to coincide with the approval of the project by the Public Authorities Control Board. And I reported in February on developer Forest City Ratner's apparent plans to make Miss Brooklyn an office tower only. But the Daily News, a day after publishing developer Bruce Ratner's exclusive op-ed and a nonskeptical Cliff's Notes article accompanying it, is not asking the hard questions. Nor does it point out that the project now appears to have 15 towers, not 16, as hinted in Bruce Ratner's op-ed yesterday. The new renderings, of course, picture Phase 1 complete, rather than in stages, leaving possible vacant lots around the arena block, as the New York Post depicts today. The complex has been planned to look whole and complete during each phase of construction. "My enthusiasm for Atlantic Yards has grown and grown until arriving at our current design, which works better with the surrounding area than it ever had before," said Gehry of new designs obtained exclusively by the Daily News. "Miss Brooklyn, now called Building One, has been slimmed down and has become more festive, resulting in a very unique office building," he said. Once "sleek," it now resembles "a spiraling Lego structure, edges askew," according to the Daily News. The Daily News reports that the building would include 650,000 square feet of office space, which is more than the 528,000 square feet described last October. Given that the building was once supposed to also include a hotel with 164,652 square feet, it's a good bet that the revised plans trade hotel space for office space. Planned condos "will be shifted to a different building or be built as rental units instead," according to a Ratner official. Meanwhile, "B2," which will be completed first, is a red-and-pink-hued, 340-foot building featuring 350 market-rate and affordable apartments, which Gehry said "speaks to the residential fabric of the neighborhood." As the top two renderings suggest, the design seems little changed. If 30% of the apartments are to be affordable, that means 105 affordable apartments, with 42 of them low-income. Building 2 is supposed to open at the same time as the arena; the developer says 2010, but that seems highly speculative. Nor was the developer asked if the project would contain 16 towers, as approved, or 15, as hinted by yesterday's Daily News article. Notably, the revised renderings show only three buildings: the arena, Building 1, and Building 2. 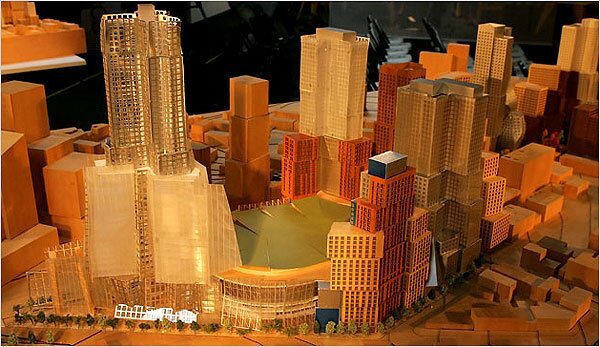 Previous renderings showed Gehry's designs for the entire arena block. Does this mean Gehry's working on only three buildings and may bow out after that? Or is it that designs for other buildings may change as time passes? 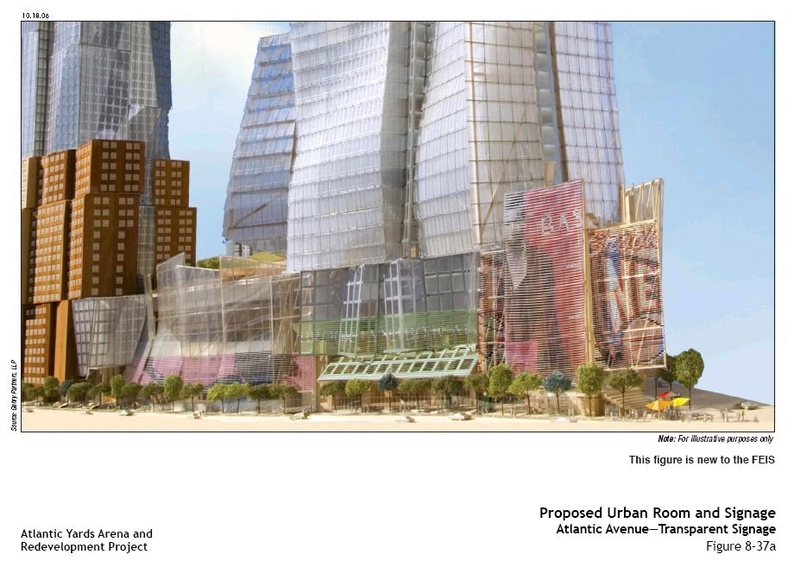 Note that Forest City Ratner has taken down the Image Gallery from the Atlantic Yards web site that showed renderings of the buildings as well as landscape designs. Also missing is any rendering of a building at Site 5, on the block bounded by Pacific Street and Atlantic, Flatbush, and Fourth avenues, now home to Modell's and P.C. Richard. That building, which was reduced to 250 feet after a "recommendation" from the New York City Planning Commission. There's no explanation in today's article about how arena-goers would enter the arena without the planned Urban Room civic space--will there be a temporary "Urban Shed" ushering them from a new subway entrance? The renderings do show an Urban Room--albeit without the massive signage planned (right)--attached to Building 1, assuming it gets built. The arena appears to have new metal flaps reminiscent of some other Gehry buildings, which would lessen the amount of glass. That may be a response to security concerns raised in the wake of the closure of streets outside Newark's new Prudential Center. Forest City Ratner officials were cagey about the exact distance between the arena and the street; they finally acknowledged to the New York Times that the arena would be, in fact, only 20 feet from the street. In another article published today, headlined Opponents say Ratner's time line for Atlantic Yards is pie in the sky, the Daily News does allow opponents to express skepticism. "His project is in serious jeopardy no matter how he spins it," Daniel Goldstein of the anti-Brooklyn Yards group Develop, Don't Destroy Brooklyn said of Ratner's Op-Ed piece in yesterday's Daily News. In it, Ratner claims his entire NBA basketball arena and skyscraper project will be finished by 2018. Goldstein said a lack of committed financing - including housing bonds - and ballooning construction costs could drag the project into a 20-year ordeal. "When he says he plans to complete his project in 2018, it's simply not credible," Goldstein said. "It means nothing." While the article doesn't make this point, I think the single strongest reason for skepticism is Ratner's statement that "We anticipate finishing all of Atlantic Yards by 2018." After all, as I pointed out, executive Chuck Ratner of parent Forest City Enterprises told investment analysts last year, "As you know, in our business, these things take a very long time, most often, frankly, longer than we anticipate." The article also quotes Council Member Letitia James, who says, "It's the same plan without definitive financing." James Caldwell, president of the nonprofit Brooklyn United for Innovative Local Development, said he continues to back Ratner and the development plan. "I feel better, especially with the way the economy is right now, that everything is going ahead as planned." The Long Island Railroad yard at the intersection of Flatbush and Atlantic Ave., where Bruce Ratner intends to build the Barclay Center, future home to the New Jersey Nets and the centerpiece of the Atlantic Yards project. Congratulations to Frank Gehry- What an incredible redesign of “Building 1"- The redesigned Ms. Brooklyn will forever be a memorial: A memorial to the stack of discarded pizza boxes that were tossed after Ratner fed and paid the union guys to mill around in support of his subsidies.- - - Is Atlantic Yards “Pie on the Sky?”- Well the Gehry vision is Empty Pizza Pie Boxes in the Sky! The sooner Atlantic Yards is taken back to the drawing board the sooner the union guys will be working at good jobs- And work that would not put them at odds with what’s good for Brooklyn.